As the annual season of parties and gatherings approaches, it's always a good idea to have a solid punch recipe on hand. 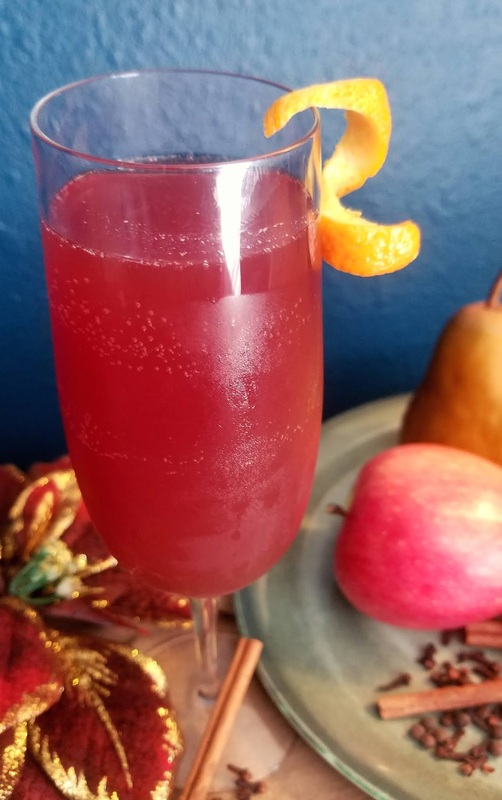 Generally, speaking, many people rely on old standbys like juices mixed with ginger ale, or basic throw together combinations of citrus and liquor. Not that there's anything wrong with those, but I personally love a holiday punch that has a bit more complexity of flavor. When it comes to the holiday season, colors and scents are, to me, desirable elements in creating the ultimate party beverage. It's far more fun to have a drink that looks and smells just as festive as it tastes! 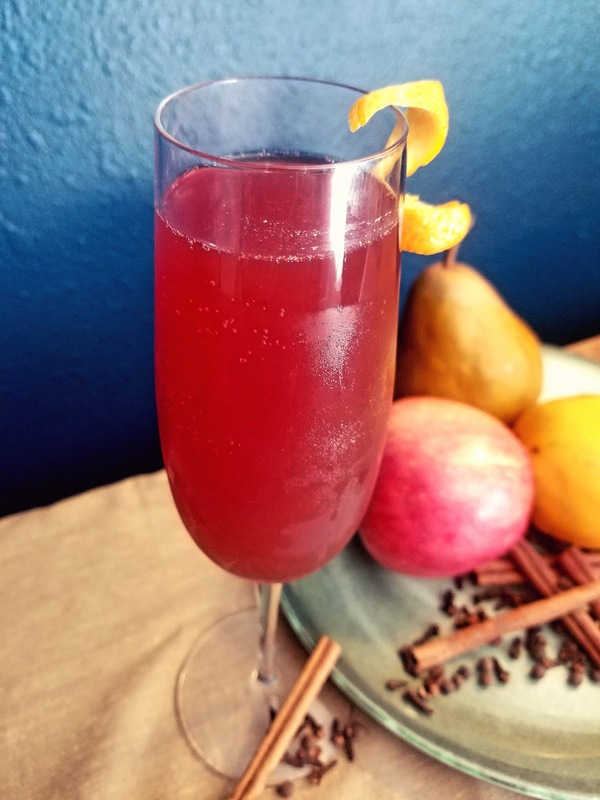 I'm a huge fan of ciders and mulling spices during the colder months, but having something that sparkles in a glass seems to imbue the essence of holiday style. The following recipe is one I recently created to compliment both the cozy and the sparkling, and, it's already a favorite request of friends. Bring it to a low boil, and simmer for 25 to 30 minutes, stirring occasionally. 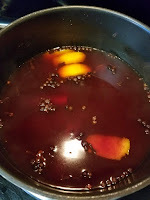 The point of doing this is to allow the flavors of the spices and zest to diffuse into the liquid, ultimately creating a higher concentration of flavor in the cider itself. Strain the cider into a large container to cool. Note: if you opted to use ground spices instead of whole, you'll need to double strain the cider to ensure removal of the grounds. For cooling, I tend to use a metal container, so that the temperature reduces more swiftly. Simply either surround the metal bowl with ice before straining the cider into it, or, you can place the metal container of strained cider into your freezer covered lightly by a dishtowel. Either way, let it cool for at least 30 minutes so the liquid achieves near room temperature before pouring it into a glass punch bowl or pitcher to chill completely. Once the cider is chilled, add 8 oz of Amaretto liqueur and stir gently. Note: If you're adjusting the recipe quantities, the ratio of liqueur to cider is 1/2 oz of liqueur for each 1/2 cup of cider, or to put it in larger quantities, 4 oz of liqueur for each 1 quart (4 cups) of cider. Right before serving, slowly add 1 bottle (750 ml) of Prosecco, or, you can simply fill each champagne flute about 3/4 full then top them with the sparkling wine. Garnish with an orange twist, and add a cinnamon stick for a spicy aromatic if you like! The cider for this punch is wonderful solo, so if you prefer to serve it hot, simply strain after mulling, and serve with, or without, the amaretto. If you want a bit more spiced fruit flavor, instead of the sweet nuttiness that the amaretto adds, feel free to use apple or pear brandy in place of it. If you choose to go non-alcoholic but still sparkling, leave out the liqueur and substitute ginger ale or orange seltzer water for the prosecco. 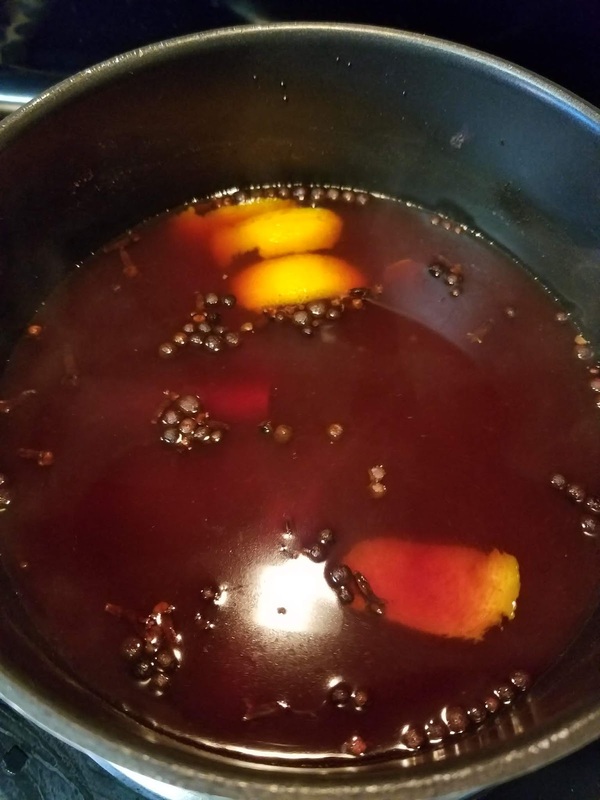 Regardless of how you serve this punch, you'll end up with a party favorite beverage, and a festive smelling home from the mulling process. What a win win! As always, let me know if you've tried the recipe, or if you have any questions. I'd love to hear from you!